The traditional Spanish fare is a surprise amid the noise of Deep Ellum. The corner of Elm and Crowdus streets in Deep Ellum may seem like an unlikely place for a hostel, given that it is often so loud so late. It is inhabited by the packs of revelers who spill out of Punk Society and the bikers who smoke in front of Reno’s Chop Shop Saloon. Stranger still: this seemingly random place for nomadic people to sleep is also home to Izkina, an avatar for a new kind of non-restaurant restaurant, a deconstruction of the idea of what a dining establishment is or could be. This kind of skill and ambition would be rare enough in Deep Ellum on its own, without it also bunking with dorm rooms. Once inside Deep Ellum Hostel, the affiliation with a place of slumber may not ever come to your attention, unless you stumble through the door that leads to the half of the building reclaimed from abandon after a century of use. Owners Collin Ballard and Kent Roth (who also own Austin’s Firehouse Hostel) spent time in Spain as students and after graduation. Izkina, the Basque word for “corner,” is a reference to the spot, but also to the menu, which brings together the tapas tradition of small bites with the no-waste ethos of fermentation and preservation. 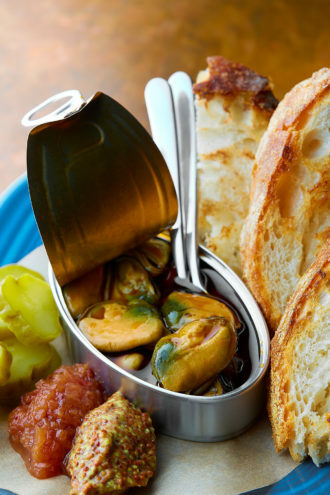 It’s Lid: Imported tinned seafood, accompanied by house-made whole-grain mustard and seasonal jam, includes mussels in escabeche (left), scallops in tomato, or squid in ink. At the back, you see the promise and lure of a lighted window pass, topped by drying herbs, that joins the long bar on the right. Ah, there will be drink and provender. A paper menu lists a dozen small plates, charcuterie and cheese boards, and imported tinned seafood. Executive chef Joel Orsini may seem to emerge out of nowhere. But the chef working in a shoe box-size kitchen under hanging plants is admired by other chefs. His Instagram tells of his desire to #preserveeverything and #saveeverything. Like Misti Norris, he worked at FT33, adherent to a practice of cures and powders, pickles, embers, and brine. In the dark, these flavors come at you. In Spain, I remember stumbling from San Sebastián’s cobblestone streets into places like this to learn the way of pintxos, the bite-size bar snacks that channel not only their ingredients, but the moment, the atmosphere, the night. At Izkina, it is the same. The first time I ate here, the Spanish tortilla came steaming and unctuous, ready to cut into slices, with wonderful, farm-egg yolk flavor and a smoky, half-velvety mojo picón. Already, I knew. Orsini taps local farmers and leans in: house-made plum vinegar, shrimp oil made from the shells, and a summer-fruit XO made using scraps from Ibérico ham, jujubes, figs, and sugar cube cantaloupe. Quickly, you uncover how his no-waste kitchen allows the food to be surprisingly layered and complex. The simplest tapa, pan con tomate, doesn’t have to be creative, but is. 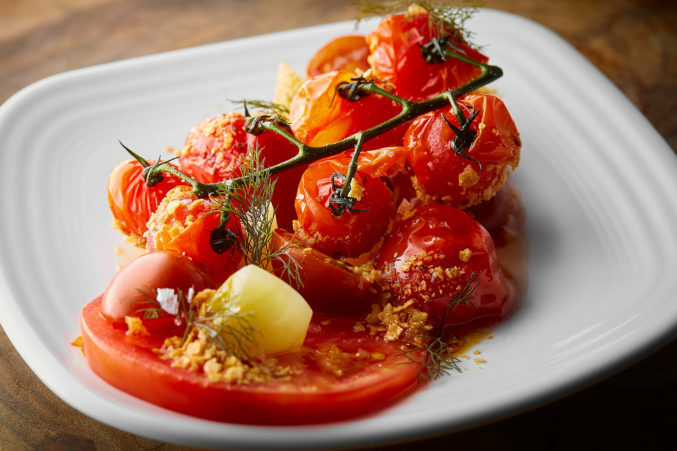 Under blistered sungolds, sweet and tangy with juice, charred bread is rubbed with a jam made from smoked paprika and plancha-blackened local tomatoes. One evening, a DJ spins, images haunt one wall, and I sink into a couch to eat cured fish and potato croquettes served with a slaw of apple, onion, fermented honey, and herbs—like shaggy latkes passed through a bohemian, local forager lens. If, that is, your Jewish grandmother fermented her potatoes with homegrown parsley seeds and garlic. These unite with big flakes of fish cured with a blend of salt, sugar, and pink peppercorns. Preservation alters the picture: you’ve encountered these things, but not like this. That there would be a wealth of seafood on the short menu makes sense for Spain’s northern coast. Poached shrimp, perfectly cooked and butterflied open, have the good sense to mingle with a lightly acidic dressing (this turns out to be the plum vinegar), while the floral fanned slices of Jonagold apples brush up against the caramelized notes of whey, in a tuile shape that adds texture. For Spanish rice-stuffed squid, the skins, barely there, make delicate casings for rice seasoned with paprika pork, chicken livers, and that summer-fruit XO. They are flavor torpedoes like Spanish boudin, just a little chewy. This is where you see the small-batch care that belies relatively small price tags. Pork collars, simmered in milk just shy of rapture—tender cubes, deeply porky in flavor—loll in a jus that reminds me of a French rôti de porc (a tenderloin roast). Limpid and light, the liquid left from the braise washes the meat with more flavor. Brined banana peppers and fermented eggplant take a little getting used to. If you want, tinned seafood arrives, lid curled back, flanked by house-made jam and whole-grain mustard. (You may not think this combination would work with, say, squid in its own ink; it does.) I wanted to keep going, splurging on the tuna belly or the bay scallops, at $22 twice the price of most plates. 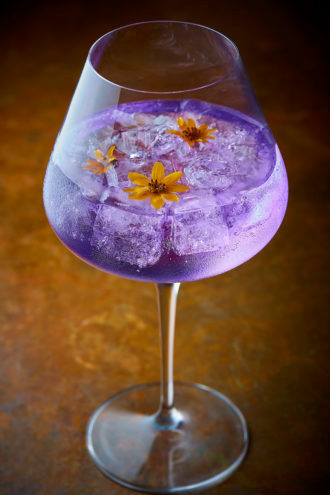 Drinks include a butterfly pea flower-tinted gin and tonic from a list of 10. Bar manager Scott Augat, who previously worked at FT33 as well, leans scrupulously Spanish. The wine list is a primer for varietals worth getting acquainted with that have a way of wrapping themselves around the food. Albariños, Tempranillos, and Garnachas, but also bottles for which the wine list’s tasting notes are useful: “quince, blanched almond, salinity” for the Godello-Doña Blanca blend. (Orsini makes his rotating jam from the fruit pulled from the cocktails’ house-made shrubs.) There are also an assortment of Cava Bruts and a 10-deep declension of gins and tonics, if the bar, shaky on stock, has the requisite parts on hand. If not, you can fall back on kalimotxo, the 50-50 mix often made with cheap red wine and Coke, quaffed by students on winding streets. The only times things went awry, the food fell too far on the creative preservation side, like the medley of squash I was not sure I loved. The dosalike crêpe on top tasted like its binding agent and had a way of gumming to the roof of the mouth. The squash scattered underneath in various states of smoked, charred, and brined—with dollops of puréed butterkin, very fermented tasting—were not thoroughly cooked. The dish seemed to work better as an idea than in execution. Fried anchovies’ bones felt like back scratchers on the tongue (though the spices melded). Perhaps a reminder that this is still a place where you fend for yourself in the dark, music blaring, your car possibly getting towed from behind a nearby bar. The kitchen, originally open until 2 am, now closes at 11 pm. When the shutter rolls down on the pass, it’s over for the night. Drinks still flow and the DJ still spins, flickering images pulsing along with the beat.